Bob Barr has once again made history. His is the only U.S. presidential campaign to ever be sued by its ghostwriter. In June 2008, after Bob Barr captured the Libertarian Party nomination for presidential candidate, his campaign manager, Russ Verney, requested that I ghostwrite a campaign book. 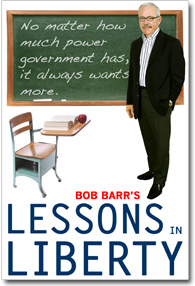 We came to terms, I wrote a book, and the campaign released Bob Barrs Lessons in Liberty. who conducted business with Defendant in the State of Maryland . 2. Defendant Barr 2008 Presidential Committee, Inc. is a Georgia Non-Profit Corporation with its principal place of business at 900 Circle 75 Parkway, Suite 1280, Atlanta, Georgia 30339. 3. At all time material hereto, Defendants corporate purpose, as stated in its charter, was to manage the business activities of the campaign committee established to advocate the election of Bob Barr for President. Upon information and belief, Defendant engaged in said business in Maryland, and in connection with such business activities entered into the contract with Plaintiff that is the subject of this action. 3. On or about June 20, 2008 Defendant, acting through Russell Verney, CFO for Barr 2008 Presidential Committee, Inc., and Plaintiff, acting individually, initiated contract discussions with Plaintiff and pursuant thereto entered into a binding and fully enforceable agreement in Maryland which provided that Plaintiff would write a campaign policy book for the Barr 08 presidential campaign, comprised of an estimated word length of 40,000 to 70,000 words, and for which Plaintiff would be compensated at the rate of $1.00 per word. 4. Defendant sent to Plaintiff, in Maryland, a $5,000.00 deposit for the work to be performed by Plaintiff in Maryland, and agreed to pay Plaintiff for the contract work all to be performed in Maryland, 1/3 of the outstanding balance upon receipt of various chapters totalling 25,000 words, and payment in full upon final edits for publishing the book. 6. Prior to August 9, Plaintiff performed further services in Maryland and delivered four additional chapters, with total text to date comprising approximately 50,000 words, and Defendant made a partial payment of $10,00.00 on or about August 9, 2008. 7. On or about August 21, 2008 defendant made an additional payment of $5,000. 8. Prior to September 15, 2008 the balance of Plaintiffs work, which was performed in Maryland, and which was ultimately comprised of 77,000 words, was delivered to Defendant who acknowledged the book as terrific and who praised the work commenting that the flow from issue to issue was seamless. On or about October 21, 2008 Defendant verbally represented that Plaintiff would be paid in full and on or about October 23, 2008, Defendant made an additional partial payment of $10,000.00. 11. Of the total $77,000.00 owed to Plaintiff for 77,000 words delivered and accepted by the Defendant, the Defendant has paid $30,000.00 and has failed to pay Plaintiff the $47, 000.00 which remains due and owing. 12. Defendant has breached the Defendants agreement to pay Plaintiff, and is indebted to Plaintiff for the remaining $47,000.00, promised but not paid. Wherefore , Plaintiff Jim Bovard demands judgment as to breach of contract against Defendant for the sum of $47,000.00, plus pre- and post-judgement interest, and such other and further relief as to the Court seems just and proper.